I haven’t exactly been keeping up with my Blogtember posts, but I thought I’d jump back with one more with today’s prompt—writing a book review. I love reading books about weight loss. Especially if it is a book about a success story. I’m always interested in knowing how people go about losing weight—not everything works for everyone—and how they managed to be successful. Many times it gives me inspiration to continue on with my desire to lose weight and become healthier. 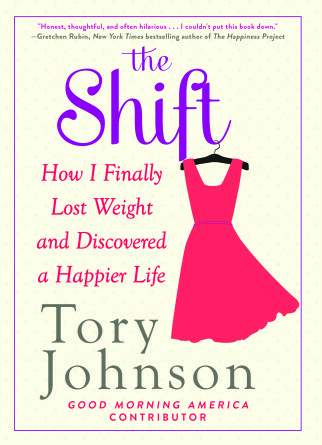 I was browsing kobobooks.com a few weeks ago and came upon a recently released book by Tory Johnson titled “The Shift: How I Finally Lost Weight and Discovered a Happy Life”. Tory is an entrepreneur and contributor on Good Morning America and the book chronicles her own journey to getting healthy after many, many failed attempts. As someone who has gone through her fair share of botched weight loss attempts, I could totally relate. I enjoyed reading the book—Tory has a knack for telling a story and she pulls no punches when it comes to describing the pressure and stress she felt to lose weight. Her trigger to finally make this attempt count? A few well disguised words from her boss at Good Morning America about how she ought to be taking better care of herself. Fortunately I don’t work in an industry where my appearance is so scrutinized, and in just reading Tory’s portrayal of how the conversation with her boss went down, I’m very glad I don’t. Like many others, Tory describes the ups and downs in attempting to shed a few pounds—from dealing with a husband and children who keep the kitchen stocked with fattening treats, to her absolute distaste for exercising (I hear you, Tory). Many of her struggles are my struggles and it was nice to read about someone who has the same feelings and frustrations that I do and how she worked to navigate those. My only real criticism of the book are some of the ways in which Tory went about modifying her diet. She rarely ate breakfast and at many points in the book she would simply not eat rather than look for a healthy alternative. She also limited her carb intake to 25 g per day and exercised very little. But this is not a diet book—it’s just one woman’s story about what worked for her, whether people agree with the way she lost weight or not. Overall, I’d give this book a B—an entertaining read but I certainly wouldn’t use her as an example of how to lose weight.